Hall, Hannah. Sunrise, Easter Surprise! Nashville, TN: WorthyKids/ Ideals. 2018. 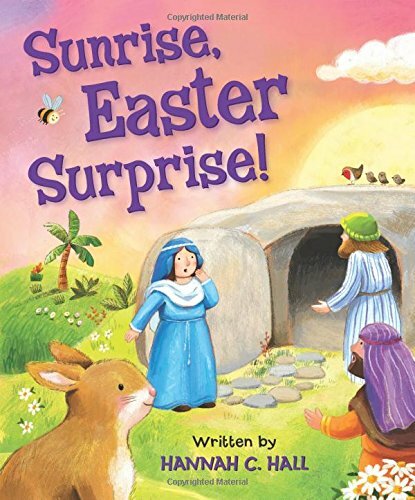 In charming rhyming verse with brightly colored illustrations, Sunrise, Easter Surprise! shares the beautiful Easter story with babies and toddlers. In a sturdy board book with soft edges and a firm binding, familiar characters delight in the risen Lord. Lambs, birds, bunnies and bumblebees join with people and Angels to proclaim the Good News. Perfect for the upcoming season and a wonderful start to faith-building, author Hannah Hall offers her newest book for children. Simple rhyming words and child-friendly pictures make this little board book adorable and very appropriate for youngsters. Filled with the lovely Easter message, Sunrise, Easter Surprise! 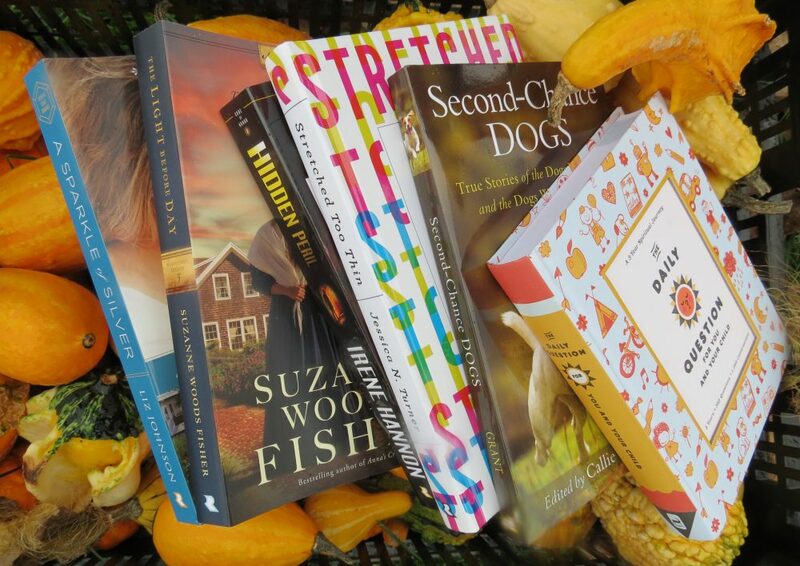 would be the right pick for an Easter basket, a church library, Sunday School or a personal bookshelf. Filled with animals that small ones can relate with easily, the rhyming lyrics are age-perfect for understanding and memorizing. Simple yet priceless on the path to a faith-filled routine. Lord, Jill Roma (author). Trunflo, Alessia (Illustrator). That Grand Easter Day! Nashville, TN: WorthyKids/ Ideals Publishing. 2018. Read to the tune of “This is the House that Jack Built”, That Grand Easter Day! follows the format in both rhythm and rhyme. Along the way of the story, main characters are introduced with the initial verse of “That Grand Easter Day!” repeated throughout. Easy to read with gloriously stunning illustrations, this book contributes joyously to the Easter celebration! Beautifully illustrated with a straight-forward, simple yet eloquent verse, That Grand Easter Day! praises the Easter jubilation in a perfect way. I loved the easy to read and rhyme stanzas with the repetition of certain phrases; wonderful to read to little ones while also being remarkable enough for new readers. Liking the bunny that appears in the story, I admire the way tradition meets contemporary with room for both. (After all, didn’t God create bunnies?) 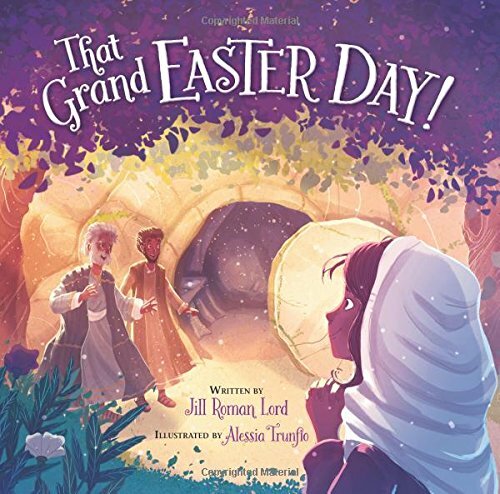 I hope to find more same-style books from Jill Roma Lord and Alessia Trunflo observing other important holidays in a like-manner. (Perhaps a series of them?) Well done! Mancini, Lee Ann (author). Sharp, Dan (illustrator). 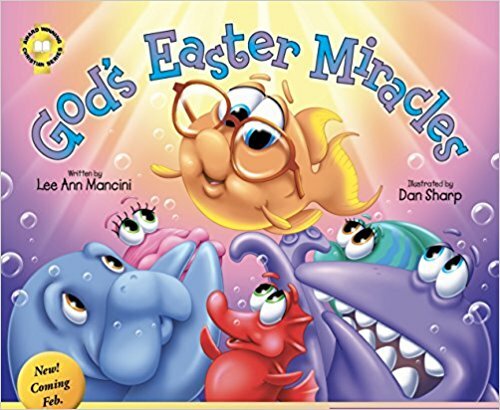 God’s Easter Miracles- Adventures of the Sea Kids Series. Boca Raton, FL: GLM Publishing. 2017. Berenstain, Mike. 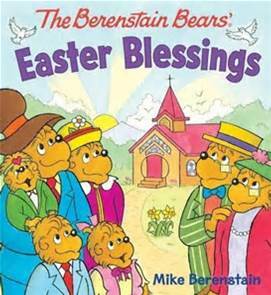 The Berenstain Bears’ Easter Blessings. Nashville, TN: WorthyKids Ideals. 2016. Starting with a delicious Easter breakfast, the Berenstain Bears begin their Easter morning. After saying grace, the Bears quickly finish with time to get dressed for church. With Grizzly Gramps and Gran stopping over with baskets of Easter goodies, the entire family counts their Easter blessings on the way to worship. A beautiful spring morning, a cozy tree house, family, friends and the many good folk of Bear Country, all are considered blessings. Along with Pastor Brown of the Chapel in the Woods, the Berenstain Bears learn Jesus Christ is risen, He is risen indeed! With yet another adorable Berenstain Bear book added to the collection, this sturdy- weighted little book is perfect for little hands. Packed with colorful pictures and the Easter message proclaimed, this book not only entertains but teaches at an age appropriate level. Trusting the Berenstain Bears to delight, my expectations were certainly met. Definitely a book for the church library and a Sunday school classroom, this quality book belongs in an Easter basket surrounded with treats. Swoboda, A.J. 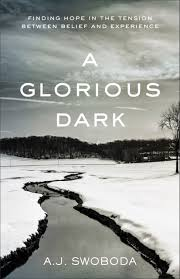 A Glorious Dark: Finding hope In The Tension Between Belief And Experience. Grand Rapids, MI: Baker Books. 2014. Perfect during Holy week and the upcoming Easter weekend (Good Friday-Easter Sunday), I found this book to be both thought provoking and well-timed. Different than what I had originally expected, I read it at face value. Though not necessarily full of Bible verses, it contained more life experiences, actions and thoughts actually based on the scriptures. Perhaps not for the newer believer, it definitely could raise questions and discussion among those encrusted in their faith. May be a good Bible study, generational discussion tool, or even sermon topic. I did find the book to be creatively titled.